Marne Lucas aka CuntemporaryArtist is an infrared video pioneer, using thermal imaging technology often associated with military, aerial or border surveillance. A New York based multidisciplinary artist, Marne works at the intersection of art, feminism and health. Inspired by the Dharma Art, and palliative care movements, using photography, video and sculpture, working in conceptual overlaps: life’s energy, the environment, beauty, identity and mortality and transformation. 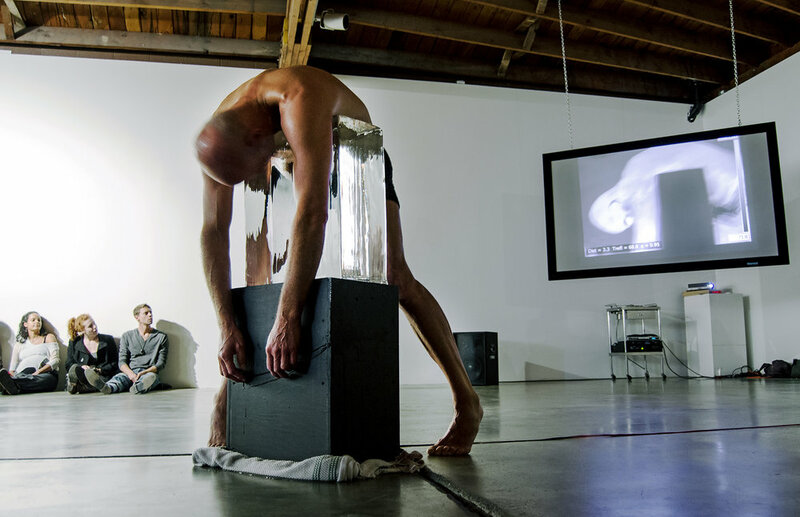 Her groundbreaking black & white infrared video work began in collaboration with Jacob Pander as they depicted the literal heat of sexual union firsthand in the cult short film THE OPERATION (1995), and later a live hospital birth in INCIDENT ENERGY (2013-15). Her solo short film HAUTE FLASH (2017) depicts the hormonal changes of menopause as a transformation of energy into a new power. The use of military-grade infrared imaging gear (surveillance cameras, binoculars and rifle scopes) is the means of digital image capture, but is also the surreal aesthetic itself; illustrating actual rapid heating & cooling temperature changes in people and objects. Unseen by the human eye, heat appears white and cold turns black, in real time with no special effects. Objects, landscapes and people have seemingly “negative film” qualities, possessing glowing transparency while maintaining surface reflections. -HAUTE FLASH was made for 'Transitional States: Hormones at the Crossroads of Art and Science' a touring video exhibition and public lecture series organized by Dr. Chiara Beccalossi, Lincoln University (U.K.) and the video exhibition curated by Arts Feminism Queer Co-Directors Giulia Casalini and Diana Georgiou (London, U.K). The work screened at Project Space Plus, Lincoln, UK / Peltz Gallery, London, UK / Centre de Cultura Contemporània de Barcelona (CCCB), Spain / LABS Gallery Arte Contemporanea, Bologna, Italy. 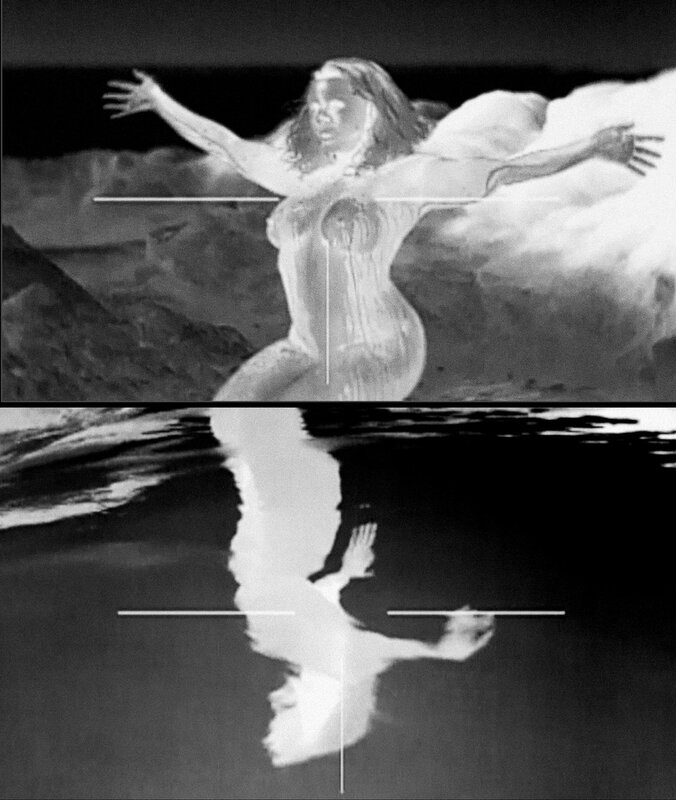 -INCIDENT ENERGY, a 4-channel, b&w infrared video (Lucas & Pander) is a creation narrative using modern dancers to convey human emotion, transporting the viewer into an ‘otherworld’ space by framing the human body within the intersection of art and science. Subtle questions are posed about how the advancement of invasive surveillance culture continues to change human interaction in practical, creative and philosophical ways. The eerie beauty of heat signatures occurring around/within us is arresting, while confronting our (c)overt acceptance of the electronic villain into our lives. Lucas also makes digital photography collages and ceramic tiles using infrared video stills to explore philosophical issues about life, death and transformation in BARDO ∞ PROJECT. ‘As Above, So Below’ was made in response to the lack of gun control and recent rash of citizen mass shootings in the U.S. and her 'Haute Flash Formation’ series of white vitreous porcelain tiles with b&w photo decals were made during an Arts/Industry Pottery factory residency at Kohler Co. factory. Marne’s essay “Incident Energy Project- An artist's Exploration of Thermal Imaging" from the proceedings of ‘Taboo - Transgression and Transcendence in Art and Science’ 2017, Ionian University. ISBN: 978-960-7260-60-4 can be read here.